I have decided to put together a “Lost City” style terrain set. Although I want to have enough bits and pieces prepped to cover most/all of a 6×4’ table exclusively in themed rubble, ruins are also pleasantly versatile for mixing with other scenery and settings. In particular, ruins mesh well with jungle terrain (such as my Krellborn IX deathworld set), making a setting as suitable for goblins, dwarves and knights to explore as it is for Inquisitors to get up to their usual internecine feudin’. A few ruins will complement St. Craniums too, which is why I used a lot of the same palette and techniques to paint elements of the Lost City of Exactamundo as I did for the cemetery. While ancient ruins certainly benefit from exciting, exotic elements (and there are some elements in the pipeline that are peculiar to the point of absurdity) if everything is special, then nothing is, so some pleasingly nondescript ruins are important to have. This is where the Ruins of Osgilliath kit comes in. The ruins of Osgilliath in “The Return of the King”. Based on the relatively austere look that Osgiliath had in the The Lord of the Rings movies, the Citadel kit is really particularly nice. The decoration is fairly non-specific (well it is specific to Osgilliath, which conveniently turns out to be a fairly generic place without predilections towards skulls or twin tailed comets or the like) but not to the point of blandness. Originally sold as three bits of ruin and two statues per set, I picked up a subsequently released triple pack, which generates enough terrain to cover a sizeable bit of table. Its rad. I recommend that purchase for more or less any fantasy gaming. I also picked up a set of the “Goblin Town” platforms from The Hobbit. I didnt assemble them as intended, as I want to use them as raised gangways between the various elements of Exactamundo, to make it more useful for skirmish gaming, a la Necromunda, Mordheim, Frostgrave. I also picked up a set of wooden fences from Renedra that to use as ladders. I like that the pretty structurally unsound looking extra elements make it look like unfortunates of some sort have repurposed the ruins to live in at some point. I also really quite like the final product for use as bread-and-butter buildings in the Lost City of Exactamundo. 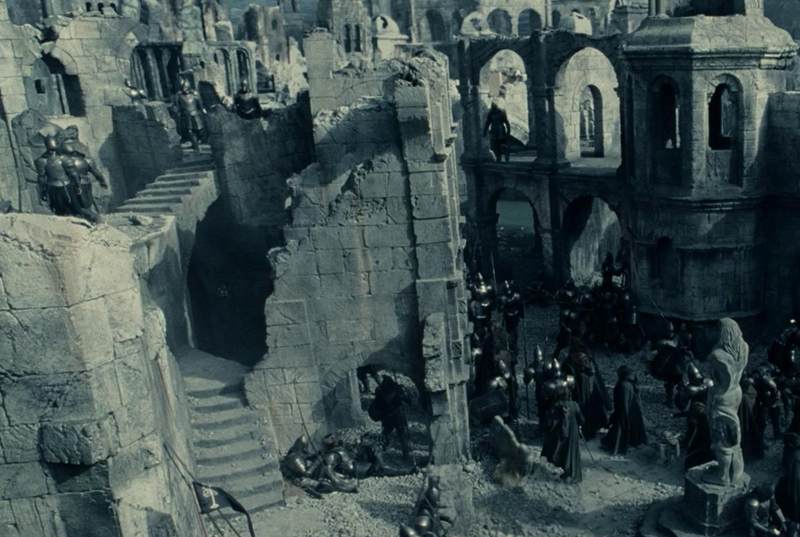 If my Exactamundo table was a video game, Osgiliath ruins would be the buildings that would repeat as your character rode his chronovampiric cyber-saur through the streets. 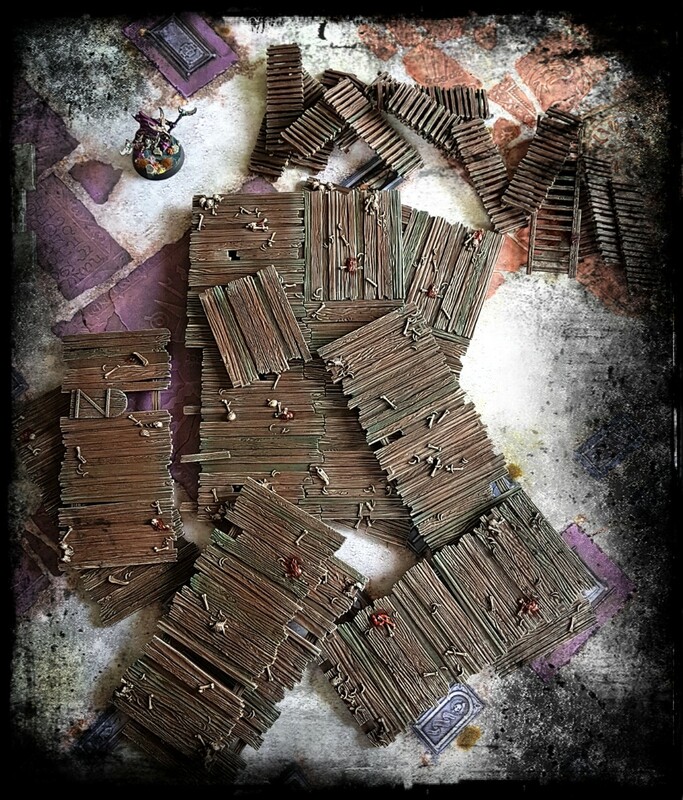 From repurposing Rendera fences to ladders, to the execution of pieces that are flexible enough to be dropped into your other sets, this is a really great collection of ideas. Lots more to come Will. Its already painted, photographed and ready to go too, I just need to polish up the posts a bit. I’m glad that you like it. I think that when its all out on the table it might be the most coherent terrain set that I have put together to date. Excellent stuff Paul. It will also make a nice setting for an old town of some faded Imperial world – a suitable place for cults to breed and Inquisitors to investigate. 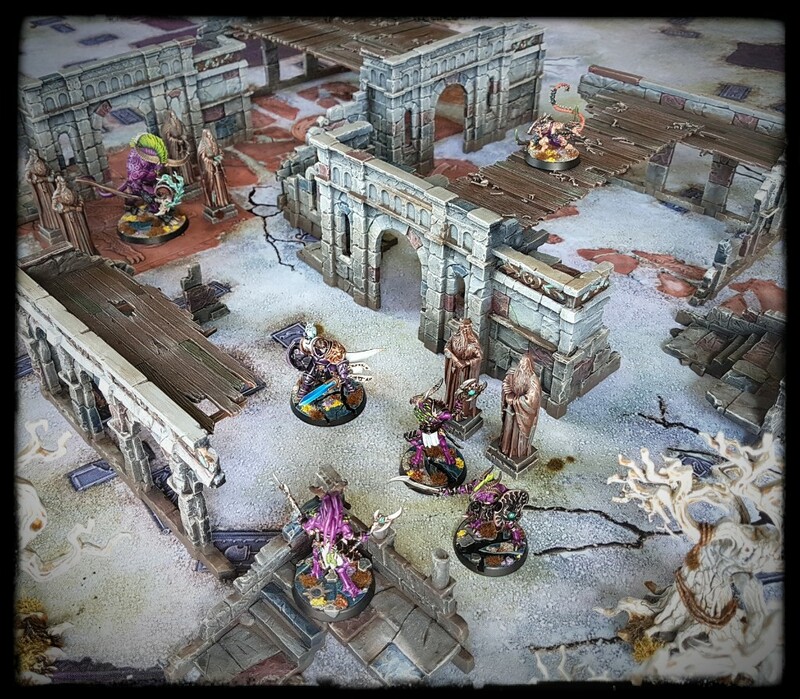 The walls have some really nice splashes of colour that avoid the dreary grey so common to 28mm scale ruins. Nicely done. Oh absolutely Axiom. Old ruins exist in the future too, even more of them in fact, technically speaking. PB has a small chaos coven on the cards already in fact, plus who knows what sorts of archaeotech a shifty Adeptus Mechanicus might dig up there too. Heh! The Ruins of Osgilliath three pack is good value. Goblin Town is twice the size for an additional 50% than it was when I bought it. This terrain set is finished at the time of writing, so it’s just a matter of spreading out the photos into bite sized chunks. I’m pleased with the final result, so hopefully it will appeal to you too. I think that you will like the direction that this project heads in. I have long longed for those kits, and you are proving why they are so useful. I think I need to step up my long distance longing to “just buy the damn things”. 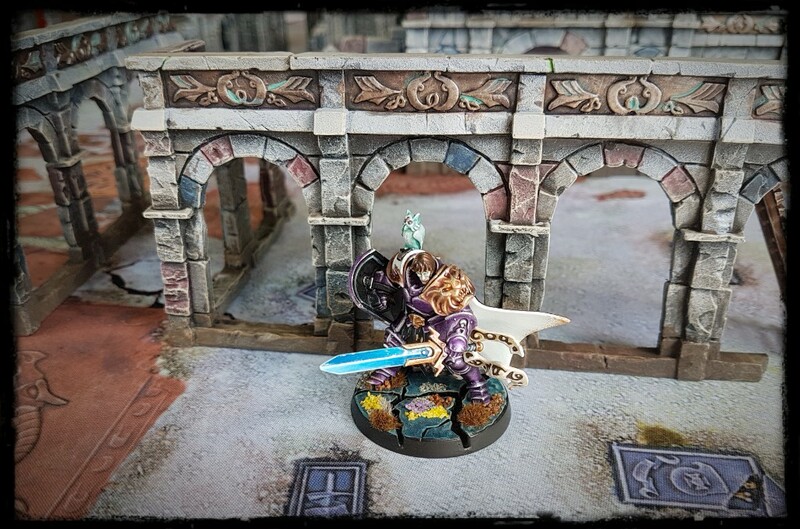 They are straightforward and rapid to assemble, sturdy in design, have a broad spectrum of 28mm tabletop applications are pleasant and satisfying to paint and are good value. They get the maximum number of thumbs up from me. If you have the time to paint them and the cash available then I thoroughly recommend them Lasgunpacker. I’ve picked up a few Goblintown platforms, and your ladder idea is excellent. I’ll keep my eye out for Osgiliath. I think that I saw the ladder idea somewhere, but I’m gosh-darned if I can remember where. Its a good idea though. I painted the entire Goblin Town and the ladders on the sprue. It worked out very well that way. While some of the kits that I have coming for the rest of the project may polarise opinion, I cant imagine anyone finding fault with the Osgilliath sets. I played a few games over the weekend and used the Osgilliath kits. I’m very pleased with them. I absolutely love the way the terrain turned out, can’t wait to see more! Thanks for taking the time to say so Andrew! Lots to come, using the same palette where appropriate. I should have another post ready over the net few days I hope. Sweet work yet again. 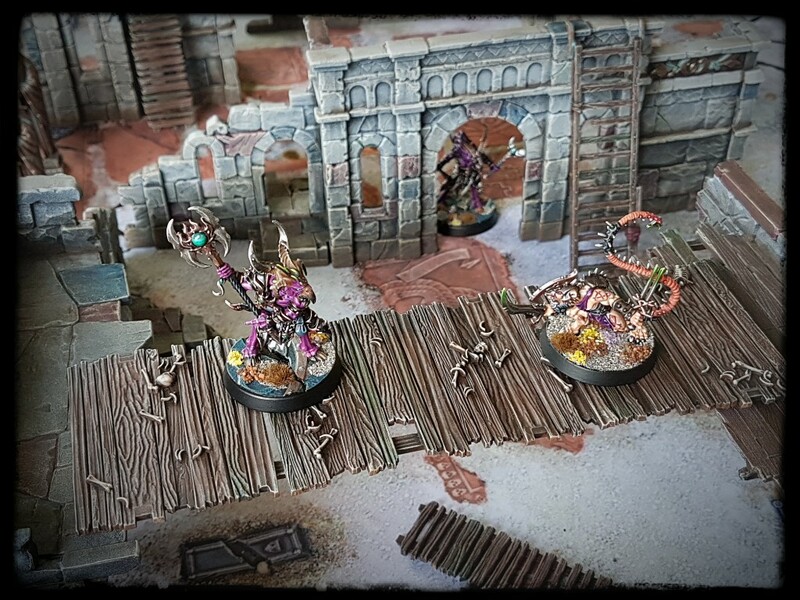 Like all the best terrain pieces, these manage to tell a story (or at least tantalizingly hint at one) especially when the bone-strewn Goblin Town platforms are mixed in. Great painting on the pieces as usual. Thanks Mikko. Hopefully you and I will get a game in on them in the not too distant future. Why’s your fantasy world called “Exactamundo”? As an archaeologist, I see your buildings and want to investigate what their original use was. Were they shops? Dwellings? Barracks? Grain stores? Public institutions? In popular culture, lost cities are often Mesoamerican and often have a certain rhythm to how they sound, along with regularly ending in “o”. Chichen Itza, Tikal, Tiahuanaco, Machu Pichu, Hueyatlaco and the like for example. Last year, when discussing what a Slann city might be called, I typed “Exactamundo” in response to a comment and realised that it sounds like a city name from a cheesy 1930s pulp. Its stuck. The elements coming later in the project are more like landmark buildings. Perhaps places of worship or government. Certainly more ostentatious than those shown. The Osgilliath ruins are very pleasing generic buildings that can be dressed with furniture or old scientific equipment if a scenario or setting requires it. I see the Osgilliath ruins representing a commercial, likely affluent area in a large settlement that expands off the table. The sort of thing that really only occurred in larger cities in real world history, but in fantasy settings like Frostgrave, Forgotten Realms, Age of Sigmar or (obviously) The Lord of the Rings where the technology level remains static but culture and populations increase or its likely more common. So in answer to your second question, I see it as the ruins of the once affluent city centre of somewhere like Felstad, Athkatla, Hammerhal or… Osgilliath. Likely no grain stores or barracks. Dwellings above shops, but likely pretty decent ones and not densely populated. Shops, buildings of worship and bureaucracy. Does that make sense in terms of real cities etc? I suspect so. This is rather excellent, and unfortunately inspiring. It’s not like I didn’t already have enough projects on the go… I have to echo Axiom’s point that the splashes of colour in there give them enough subtle difference to make them interesting without going so far as to “pop”. My previous efforts with this sort of thing had a tendency to end up looking too grey and dull. As you noted, I certainly wasnt going for “pop” with the extra colour – pop is more appropriate for the protagonists in this context I think – but more to add a little visual texture. A bit like video game backgrounds I suppose. Detailed and nice to look at, but not too distracting was the goal. Looking great! I got some of those Osgiliath ruins in a free batch of models, and they are very useful. I combine with aquarium ornaments and plants for a lost-city-in-the-jungle scene as well. Im looking forward to setting them up with the jungle terrain for some games in future. It should change the vibe of the table significantly. Originally the plan was to go for a different type of stone for the buildings, to evoke exactly that sort of Indiana Jones pulp lost-city-in-the-jungle vibe. I was going to attach the occasional bit of foliage to the buildings to help them to blend in. In the end I figured that keeping the models as flexible as possible was the smartest way to proceed.